Are you tired of looking at snow? Maybe you need a change? If you’re a JAMK degree student and you’d like to experience another country, why not go on exchange? The application period is now! 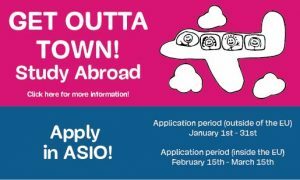 Apply by logging into ASIO. Keep in mind that you can do your practical training abroad too! There are lots of options! Please come and visit us at International Services if you have questions! We’re on the main campus in room B106! If you can’t make it to the main campus, we also have live chat available. Just click one of the intra links above and a chat window will open at the bottom right side of the browser during our office hours.